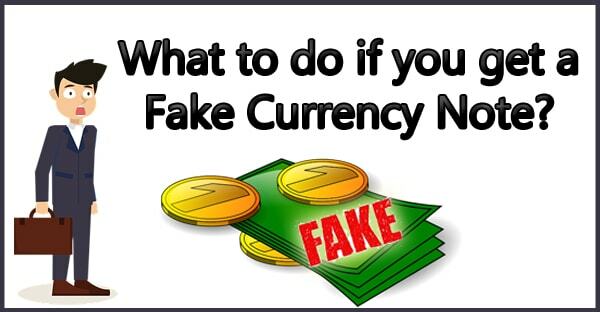 Original VS Fake Currency & What to do if You Have Fake Currency? Counterfeit notes are one of the challenges for the RBI as the number of counterfeit notes is a large part of India Economy. There were a lot of measures taken to counter this such a move is demonetization of Rs.500 and Rs.1000 Bank notes which made a major impact on the market as a lot of black money and fake currency was detected, removed from the financial system and also the people who were responsible were also brought down. Some of the other measures that the Government has taken are installing currency detection machine that detects the fake currency. With all the measures taken by the government but there is still a loophole that can be used to produce the counterfeit note. In this article, we will discuss what you can do with the counterfeit note if you ever encounter one and how to find the legitimacy of an original banknote. How to Find the Legitimacy of an Original Bank Note? Windowed security thread with inscriptions ‘भारत’ and ‘RBI’ with colour shift the colour of the thread changes from green to blue when the note is tilted. What to do with the counterfeit notes? If you got the Bank Note from the Bank ATM then the RBI will be penalized the Bank circulating the fake note and you will be provided a full refund. After getting the money from the ATM Machine and fake currency is detected then it is important for you to show the CCTV the currency before leaving the bank ATM also reports the security guard for the same. The CCTV will be used as evidence and you will be provided a full refund. What is Capital Gain? | How to Calculate Capital Gain?